Clearly, EBX has reached the peak of investigative journalism. After all, “the failure to obtain permits could cost the city up to several thousand dollars, depending on how many days the street is obstructed. “ Several thousand, OMG! And, further, the developer knows other people, and even has friends. This is right up there with the works of Bernstein and Woodward. Maybe they will make a movie: All the Developer’s Men. Oops, no, that is taken already by the orange guy who is in D.C. right now. They will come up with something else for this political thriller. 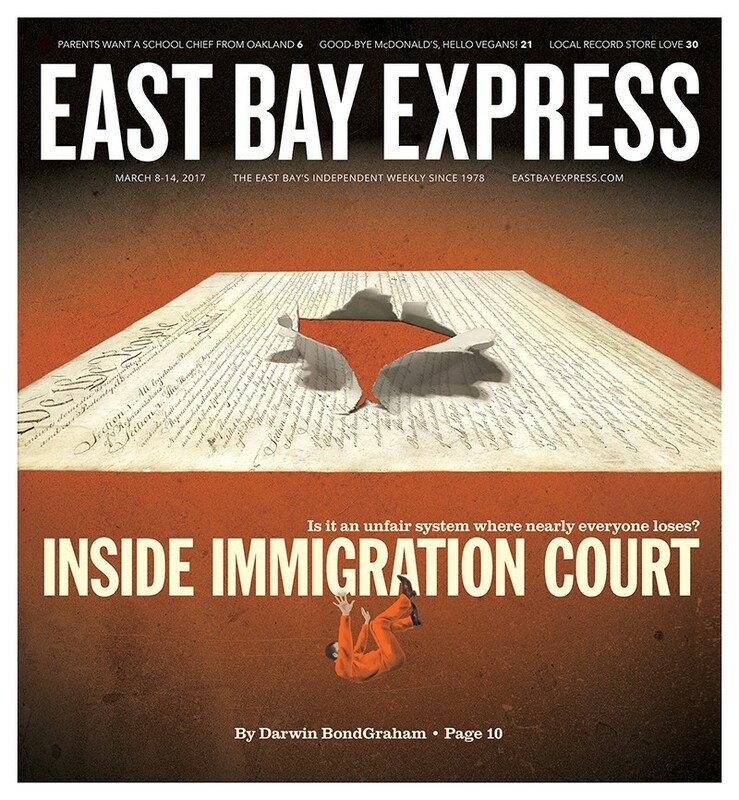 This has been a problem for years, and EBX only cares when they dredge up a Mayor Libby Schaaf connection? My lord. I’m casting a vote for home grown — let’s support promotion of worthy candidates from within the system. There is no need to spend a lot of scarce funding on national searches if we have strong candidates here. Plus, they won’t have sticker shock when they have to buy a home here! This well-researched article is truly heartbreaking, and even more so when you realize that all these unconstitutional shenanigans were happening under our constitutional-lawyer president. I hope folks that read this will support Assembly Bill 6 and Senate Bill 3. Those bills, because they have a price tag, will have trouble making it through the Legislature, much less getting our stingy governor’s signature. Data shows that most undocumented immigrants enter the United States for many of the reasons that our ancestors risked immigrating to the country: opportunities for themselves and their children. The proportion of those being arrested do no not have criminal records. Some of those who are detained are legal residents (as the Express has reported in the past). Counter the hate with information, not misinformation. For ethical vegans (and anyone else who supports social justice), the fact that they are Seventh-Day Adventists (who are against LGBTs/marriage equality, and don’t allow women to be ordained) could be an issue. I’m not comfortable patronizing them because of that, which is unfortunate, because of the other positive aspects. There are many other vegan restaurants in the area who don’t have oppressive beliefs (to my knowledge), who I’d rather support. I wonder, Andrew Zollman, if you know the religious affiliation of all restaurant owners in the Bay Area? My guess would be no, and probably many would offend you as well. Heck, there could even be, gulp, Republican restaurateurs. Do they espouse their religious beliefs or just serve good vegan food there? Have you been? What sweet irony! If this review is any indication, Daniel Patterson and Roy Choi could take a lesson from Chef Chew! This place has evidently succeeded at everything Locol (for all its pretension) claims it’s trying to do — with a vegan angle to boot — in a neighborhood where it matters. Talk about poetic (and social) justice! Also: I’m gay, and I’ll enjoy the food, even if I can’t get married in Rev. Chew’s church. I won’t resent his beliefs about human sexuality if he won’t resent mine. Would he refuse to serve me if I came in with a boyfriend? If so, he has a problem -— but I somehow doubt that would be the case. Live and let live. New Oakland Police Department headquarters and crime lab might be somewhat of an easier sell to sales and property-tax payers if Oakland could show us that crime is steadily improving (that means fewer crimes!). Yet there could be some creative thinking. A new Trump tower where OPD admin now sits. Forty or fifty stories, with a new cop shop just above the retail at street level. Kinda like where developers like to put the affordable housing. Could be a win-win (developers and cops win). How about including a new cop shop with a new Raiders’ stadium project? If we’re willing to give them $200 million in infrastructure, they could give us a $200 million cop shop. Could be tourist draw, too. Another win-win. The police building is pretty poor, but the roads we need to travel on to get there are even worse. I think our roads are a crime, and I should file a police report. Oakland taxpayers voted to tax themselves for infrastructure improvements. How about the city council discuss putting people to work on the roads to get to the new building before they build the building?